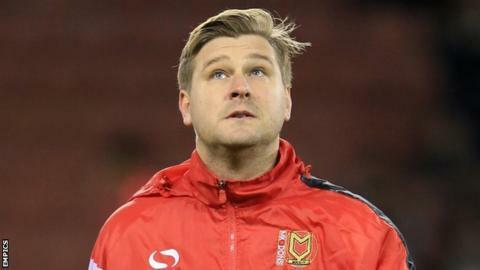 MK Dons manager Karl Robinson has claimed midfielder Carl Baker had tea thrown on him and assistant Richie Barker was spat at by fans at Crawley. "I've had a member of staff spat at," said Robinson after the 2-2 draw. "I've had a player have a scalding cup of tea thrown over his head and neck, and the person was not evicted." In a statement, Crawley said: "The club will await the referee's report and carry out our own internal investigations into the complaints." MK Dons came from 2-0 down to score a 96th-minute equaliser in an eventful game, which saw Crawley striker Matt Harrold play more than 50 minutes in goal after Brian Jensen went off injured. Robinson alleged that Baker had a cup of tea thrown over him while retrieving the ball for a throw-in, and that former Crawley boss Barker was spat at while in the dugout. "We have to get this right, for football as a whole," Robinson, 34, told BBC Three Counties Radio. "Football is getting an awful lot of criticism, and I thought the way we handled that was impeccable. "I ran down the touchline to try and grab Carl away. My player had the red mist. "You tell me any other walk of life where people can just do that and walk away scot-free. "By the way, we're not criticising Dean Saunders and his players. They were sensational today." Meanwhile, Robinson said on-loan Arsenal striker Benik Afobe is in talks over a permanent move to a Championship club. The 21-year-old has scored 19 times during his spell at Milton Keynes.